Vacations are a time for relaxing and recharging! And what better place to go than Costa Rica? 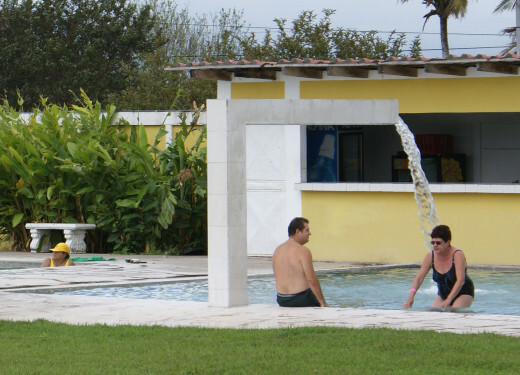 There are many places where you can go in Costa Rica and enjoy relaxing in hot springs. 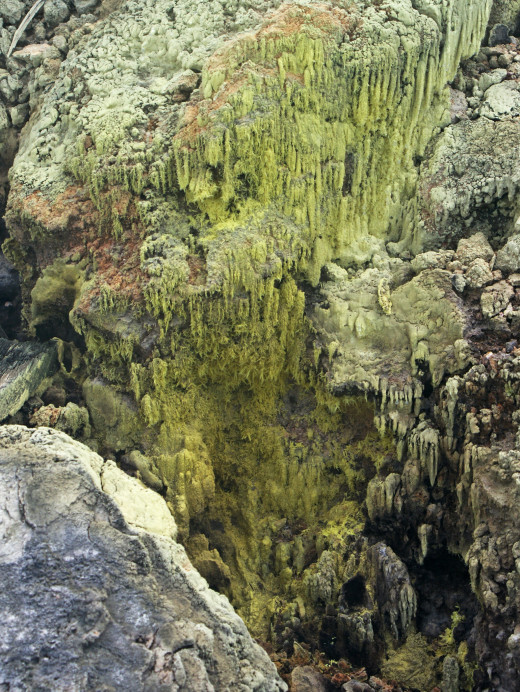 Because of the abundant number of volcanoes, there are many hot springs and some rivers that have thermal springs. There are well-known hot springs resorts around Arenal, Rincón de la Vieja, and Miravalles Volcanoes that many visit to relax from their busy tours. And many of these resorts have spas where you can take relaxation to another level. 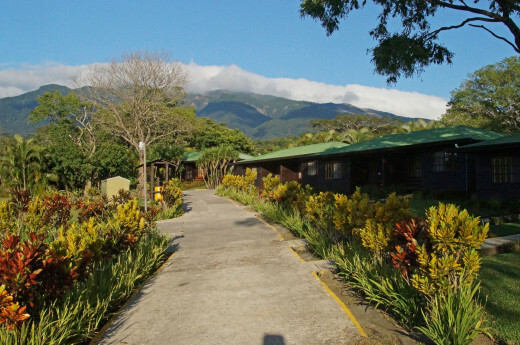 In this review of hot springs resorts of Costa Rica, I focus on the resorts in the Guancaste province, those that are on the west slopes of Rincón de la Vieja and Miravalles Volcanoes. This is the province in the northwest portion of Costa Rica that borders Nicaragua to the north and the Pacific Ocean. This province is one of the most popular tourist destinations in Costa Rica because of its dry weather during the peak of the tourist season from December to April. 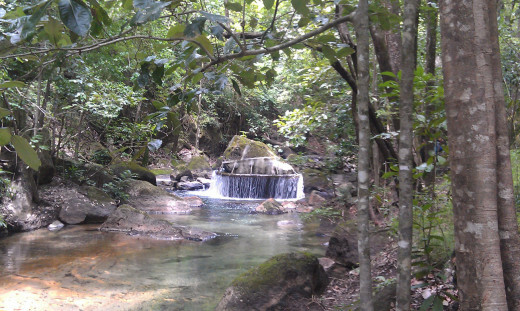 Just a few miles south and east of Liberia, there are several places you can enjoy hot springs. Most of the sites include habitations, like Termales Guayacán, Yökö, and Thermomania, three resorts that are located together near the town of Guayabo, east of Bagaces. 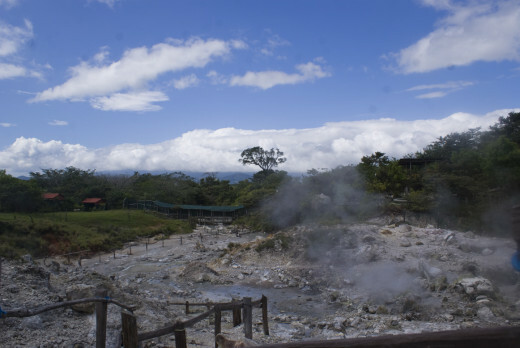 Behind these resorts you can go for a walk, which I access through the Guayacán, and visit the thermal vent site where you can see bubbling mud pots and several steam vents. The source of the water for these three sites is near the vent. 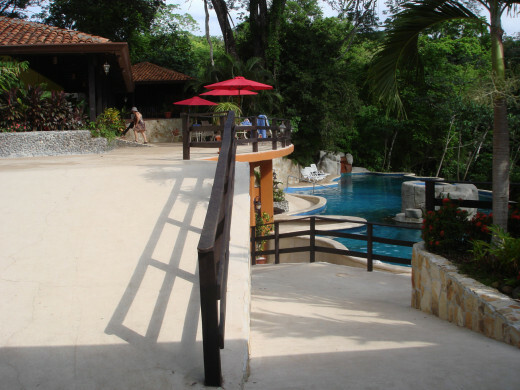 Termales Guayacán has several pools in the shade, whereas with Yökö, there is very little shade. They seem to have removed all of the trees for some reason, perhaps to build more rooms. I prefer the Guayacán because of the shade, although the pool water isn't as hot. Both of these resorts have habitations and restaurants. 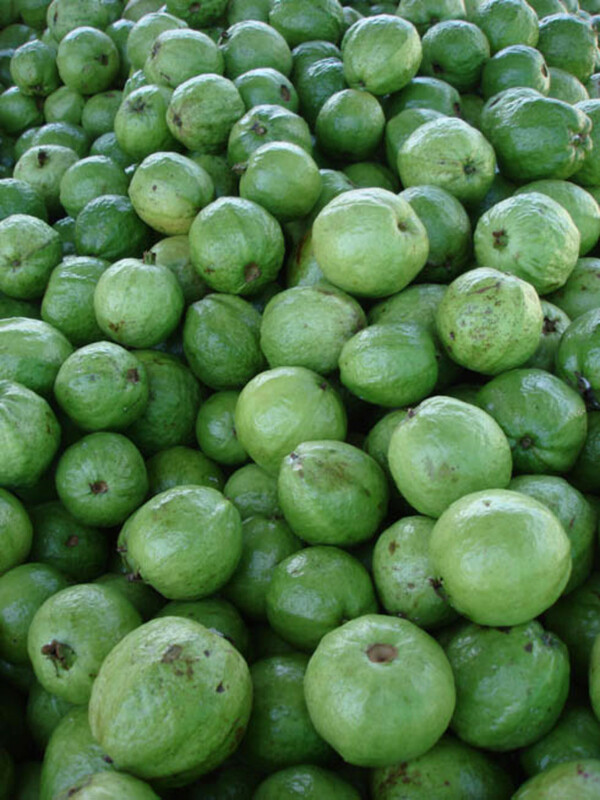 The Guayacán is more family oriented, so it doesn't have a bar or sell liquor, while Yökö does. Yökö calls their bar a "humid bar" on their English version of their web page, perhaps because they think it is a direct translation for wet bar in Spanish - bar húmedo. Down the same road where all of these three resorts are, about 6 or 8 kilometers and a little to the east near the town of Fortuna, is the steam crater known as Las Hornillas (or the ovens). There is also a geothermal site next to there where the country's power company, ICE, makes electricity. Las Hornillas is a huge crater that you can drive up to, with many steam vents, mud pots, hot pools and a place where you can cover yourself up from head to to with healing mud. They have some interesting sculptures there and a steam spa. There is a restaurant there where you can have lunch, or a casado, as they call it. You can also go on a horse ride or take a tractor-pulled wagon on a tour of waterfalls in virgin forests that are nearby. This is a new resort which opened this year (2012). 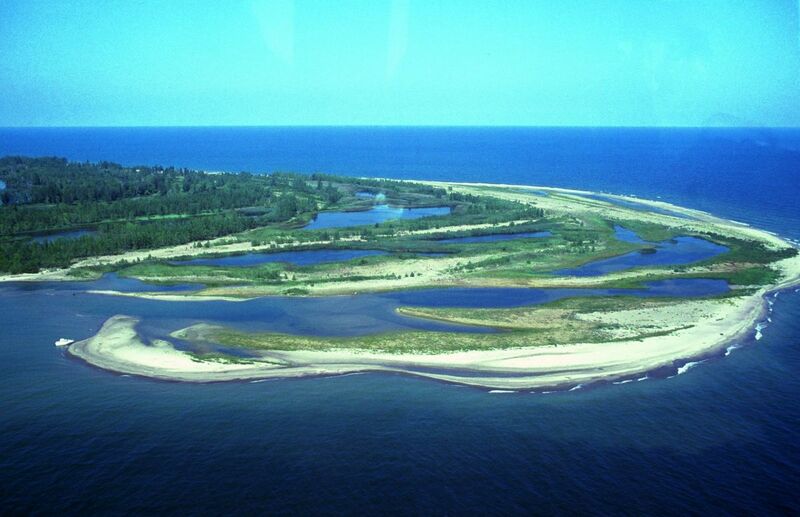 It is also near Miravalles, and is southeast of Fortuna (de Bagaces). This resort is located above a hot springs river in a steeply descending canyon. It is remotely located. The several kilometer road to this resort was specially built for it. This resort, which will have a hotel in the future, offers a package that includes lunch and bathing in their three hot springs pools. There are also 16 kilometers of bike trails and hiking trails down to the river, where you can loll around in the warm water. The trails down to the river are steep, so if you have bad knees, I don't advise you taking the trip - stay above and enjoy the pools. One of the features that I like about this resort, because I am a botanist, is that there are labels on the trees identifying the species. I have published a large number of photos on the Guancaste, Costa Rica blog under the title "Trees and Shrubs of Guanacaste As Seen At Rio Perdido." You can also pre-arrange a trip there to do some early morning birding with a guide (which is on my list of things to do). 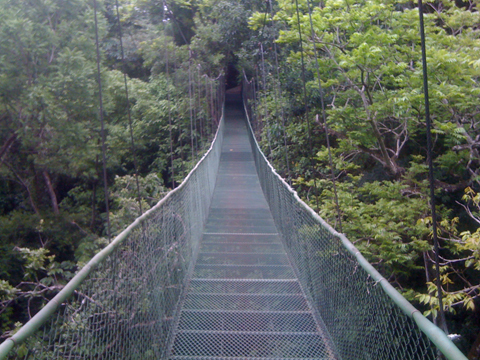 On the hiking trail, there is a suspension bridge at the beginning and there is a short leg of the trail that goes to a steep overlook that has a small waterfall, shown in the photos below. There are photos of the resort below. The cost of the day with a meal is $45 per person. Without lunch, it is $35 per person. Drinks and snacks are extra. Beers currently go for $4 each. In the Guanacaste province, there are at least three places that have hot springs or spas: Hotel Borinquen, Vandara Hot Springs and Spa, and Buena Vista. The first and third locations have accommodations for an overnight stay. Hotel Borinquen is upscale in pricing and accommodations and the Buena Vista resort has more moderately priced rooms. 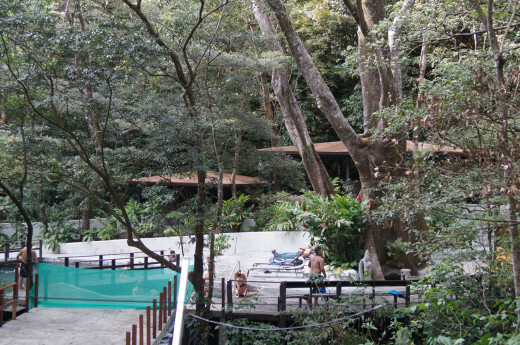 The hot springs and spa area for Hotel Borinquen are very close to the rooms, whereas you take a 15-minute ride on a tractor-pulled trailer up and down steep foothills and through the forest to get to the spa for Buena Vista. You can also opt to take a horse ride to the spa. I walked there once to take photos, and the round trip by that means is about 3 hours - if you take your time. 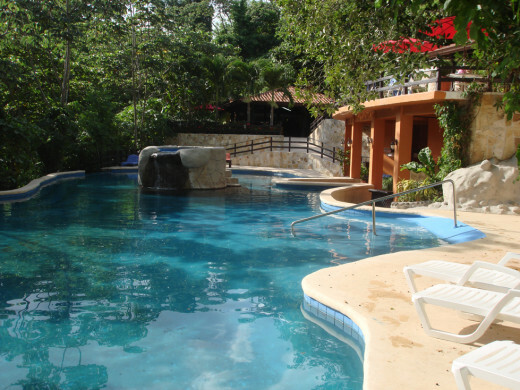 Vandara Hot Springs and Spa, like Rio Perdido, is a place to go for a day visit. The restaurant here gets 4 stars from me. The food is fresh, well presented, gourmet and served in several courses. 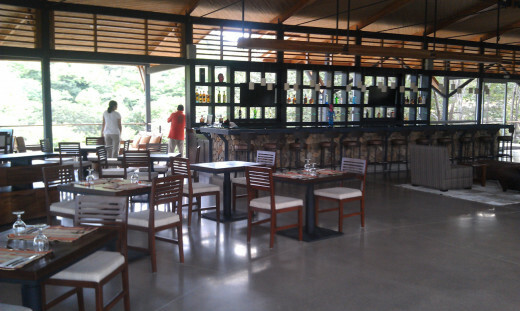 They raise most of the food served in the restaurant on their adjacent organic farm. 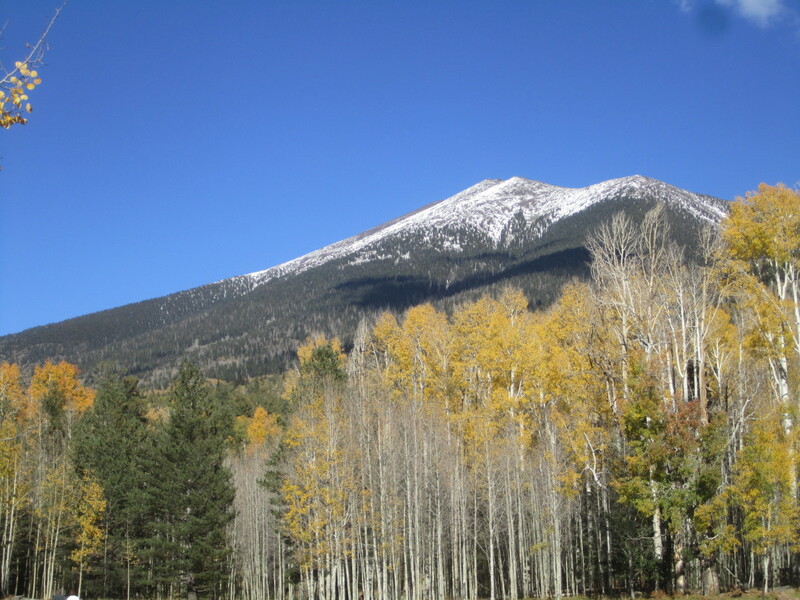 Besides soaking in the hot springs pool, you can go horse riding and do zip-lining. You can combine both. To get to the resort, you pass through Cañas Dulce and go a few kilometers and then turn right. Access is by foot on a sidewalk and over a suspended bridge. I would rate this pool as easy access for those who have mobility problems. Further information and photos are found in my Vandara Hot Springs Resort blogger article. Buena Vista and Hotel Borinquen are along the same road past Cañas Dulce, just keep on going straight. 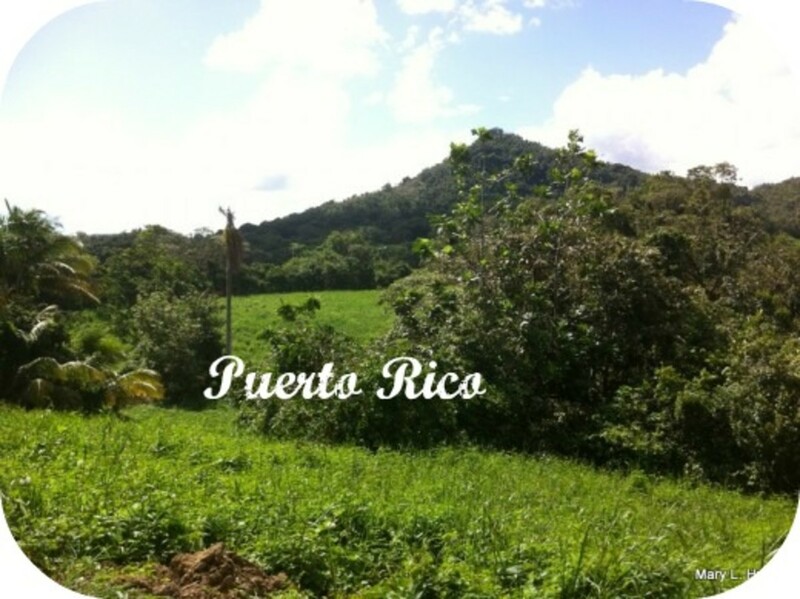 You will get to Buena Vista first and Borinquen is a few more kilometers north. At the hot springs in each of these resorts, you can treat yourself to steam rooms and mud baths. 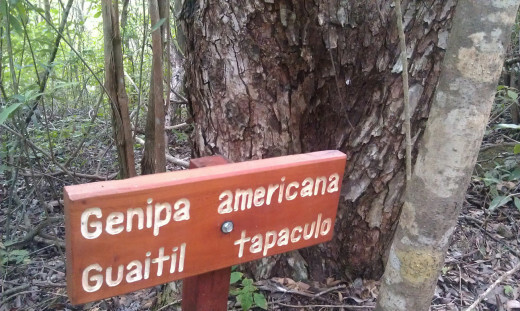 At Guachipelin, be sure to carry some bug repellent to put on when you aren't in the water. The biting midges and no-see-ums are hungry there, as you are deep in the forest. But the trip to their hot springs is worth it - this is probably one of the better spas in the region. 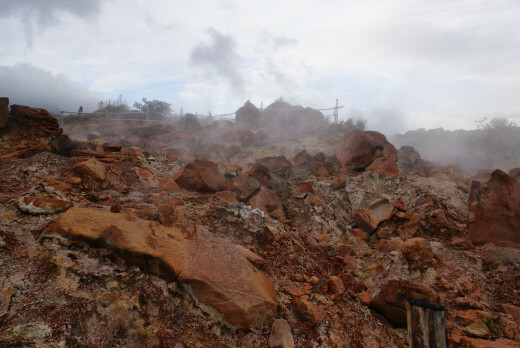 The spa for Hotel Borinquen is situated over steam vents and mud pots, so it is a visual as well as a sensual treat. 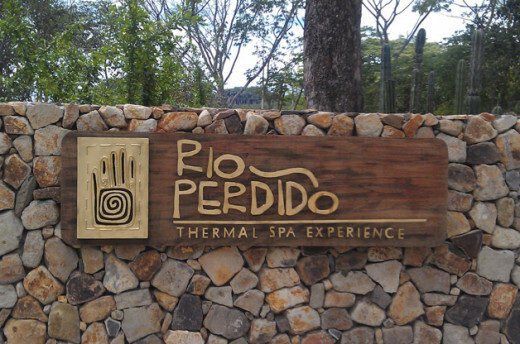 If you want an authentic natural spa, and you are in this area, this is a great place to visit. Blue River is another site to go on the north side of Rincon de la Vieja. I have reviewed in in an earlier post, so check out the Blue River Resort review by clicking on the link. This place has a prolific tropical garden, a butterfly garden, several pools and newly built rooms. This location is actually in Alejuela province bordering Guanacaste; but it is accessed via Highway 1 going north from Liberia to the Quebrada Grande road, going east. The food is great here, they have a trained chef on staff. The river nearby is one of at least two rivers in Costa Rica that is tinged blue due to volcanic mineral content. If you are looking at taking relaxation to a higher level, you can get a massage and at the following resorts: Rio Perdido, Vandara, Buena Vista Lodge, Blue River and Hotel Borinquen. 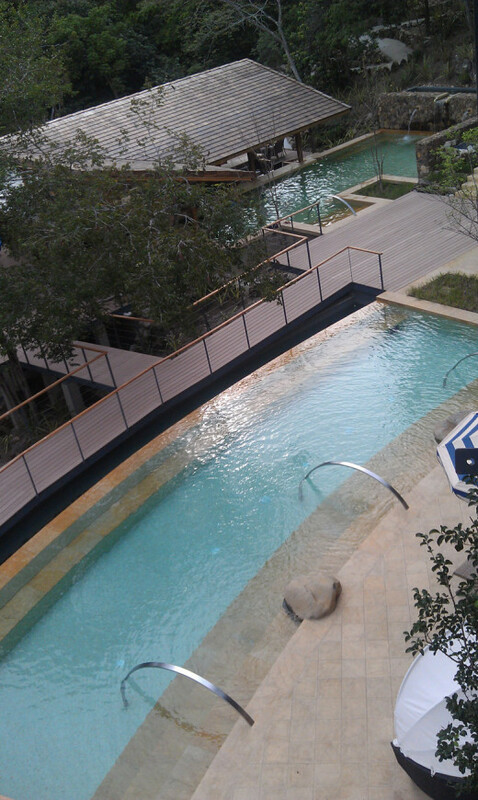 The spa facility at Vandara overlooks the river and the one at Rio Perdido overlooks the pool area. The spa facility at Rio Perdido is the most professional I have seen, and the one at Blue River is a close second, having an exercise room as well. So of the different hot springs around Rincon which do you recommend? Combining with canyoning sounds great but not necessary. 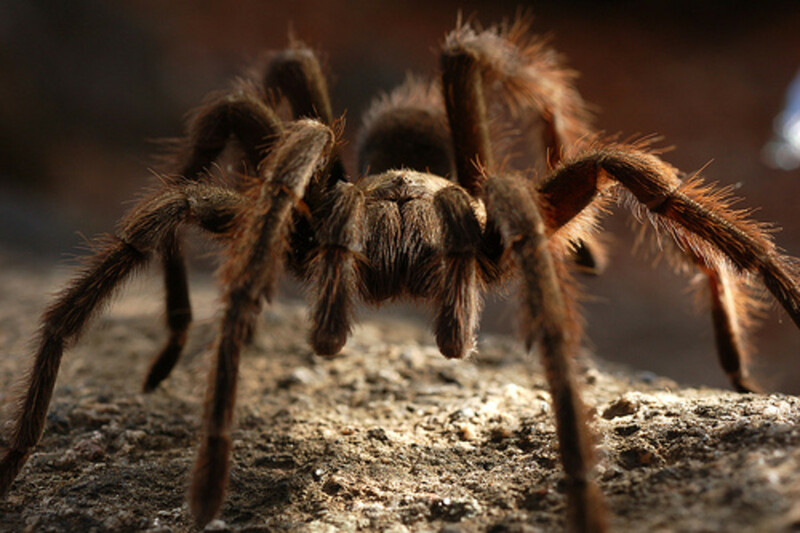 I've only been to the springs by Arenal and prefer Eco Termales. Hi shining: Thanks! 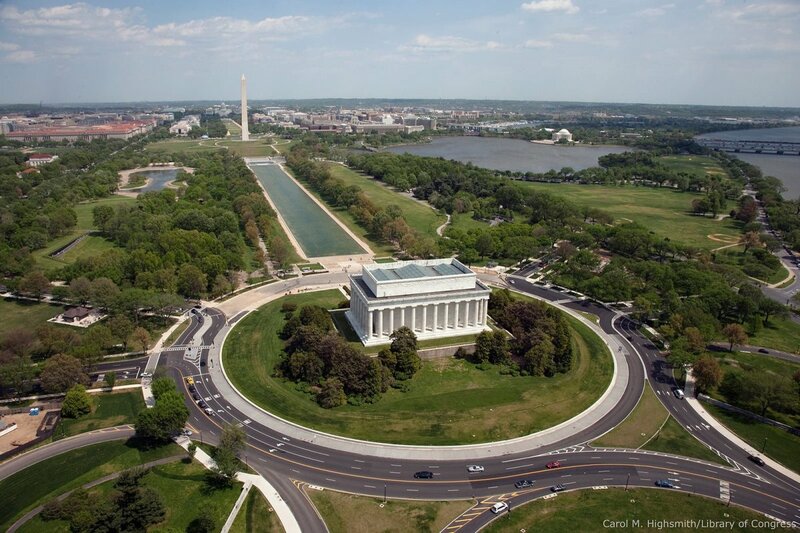 This was an easy hub to do with all of my photos and familiarity of the area. I have been to most of these places more than once. They are nice places to rest. I enjoy the warm climate here, but I am going to the U S for 3 weeks soon to enjoy some fall weather for a change I. A couple of weeks. Change is good. Randy - Great job with this review. Its an unusually cold day here in the Northeast and this hub makes me wish I could hop a plane and visit one of these magnificent places of relaxation and geographical beauty. Voting up.